Some usefull scripts to make your life easier and show how easy it is to automate Page Control. You can tweak and improve to fit your needs. 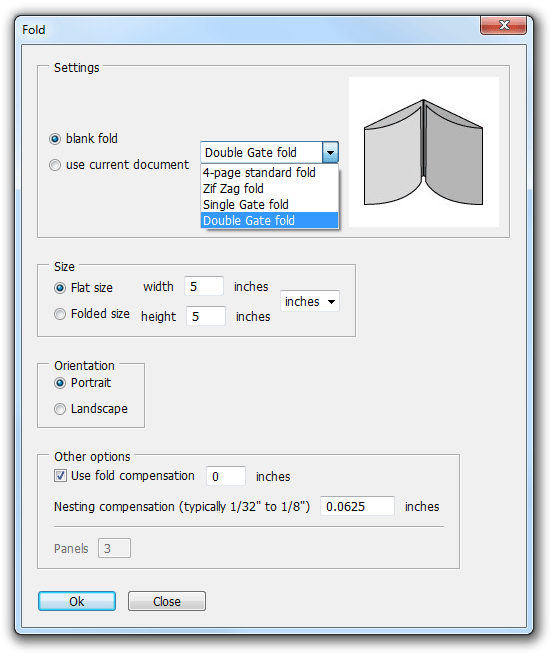 Easily create templates for four page standard folds, zig zag folds single and double gatefolds from scratch, or conver the existing document from single page to multiple pages with the right page sizes. This free script creates different types of book covers based on current document, book or user set page count, paper type and weigth. You can create matching spines for soft covers, hard covers or dust jackets with few clicks. Remember to consult the book cover dimensions with your provider too! Dust Jacket created with the Page Control plug-in and the Book Cover script (CS3 and CS4 sample inx document) You can open the document without any plug-ins, but to move the pages around you need at least the Page Control Free Reader installed. This script converts business card documents into a print template. We've created a 10 per page letter size template usable with Avery pre-cut card papers. Script is not encoded and can be easily modified to fit any desired paper, pre-cut or normal. To be able to run in-document script, you need to have either Blatner Tools plug-in, or at least the Script Manager Free Reader installed. For the most convenient use of scripts check out Blatner Tools suite and its Script Manager tool.